Jessica Chapel began writing about horse racing in 2004. Her home track is Suffolk Downs in East Boston and she believes in the serial comma. 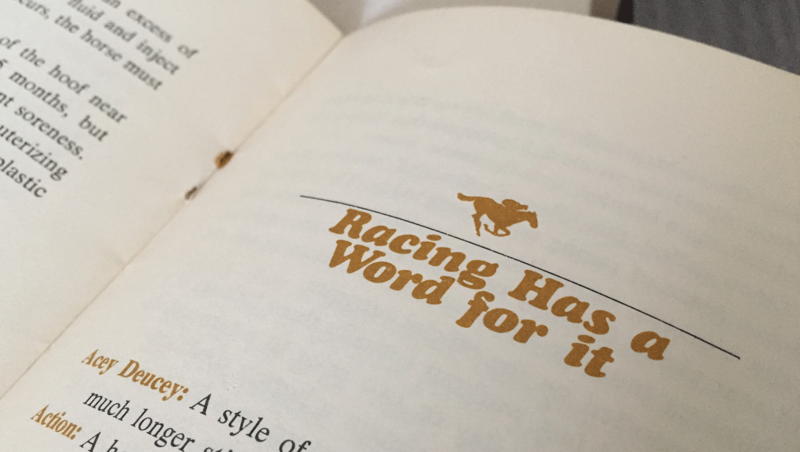 One of the many charms of horse racing — if you’re a certain kind of nerd — is that the game has its own lingo. Follow racing, and you’ll hear about horses finishing in the money and or as an also-ran, handicappers talking about favorites and the morning line, a starter described as on the muscle or dismissed as washy. If you write about horse racing, you’ve probably asked yourself at least once if it’s longshot (yes, if you’re writing for the Daily Racing Form) or long shot (the official AP Stylebook stance). It wasn’t so long ago that local newspapers kept a reporter on the turf beat and thousands of people crowded racetracks even on weekdays. Now? Well, let’s just say that local newspapers are going the way of a lot of local racetracks and that more of us are enjoying racing online and across borders. That’s why we created this site. It’s meant to be a resource, a place to look up unfamiliar terms and odd phrases and learn the history of the words we use to tell each other stories about the sport, whether you’re a writer, a reader, or just curious. Our perspective isn’t prescriptive — we’re a guide to the language of horse racing and the conventions of covering it. Join us! We’re developing a style and usage guide (primarily covering North American Thoroughbred racing to start). Please get in touch if you’re interested in contributing to the guide, or if you have a turf style question. Email us: editors@railbirdstyle.com. Or find us on Twitter: @railbirdstyle. How Old Is the Curse of Apollo?